Do you love chess? Do you love life? 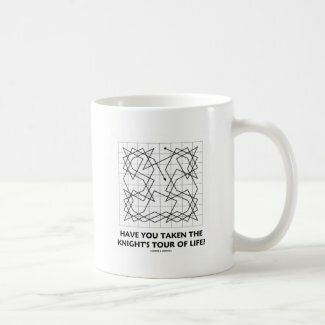 Showcase your inner chess attitude with any of these gifts featuring an open knight's tour, along with the inspirational query: "Have You Taken The Knight's Tour Of Life? "The Knight's Tour is a mathematical problem involving a knight on an empty chessboard. The knight moves according to the rules of chess and must visit each square exactly once. Ask yourself and others this key question and make others do a double-take about where they have been in life with any of these inspirational thought-provoking gifts! No need to be an avid chess player to enjoy!